LONDON--(BUSINESS WIRE)--Technavio analysts forecast the global flue gas desulfurization market for thermal power plants to grow at a CAGR of over 5% during the forecast period, according to their latest market research report. The technological upgrades in design is one of the major trends being witnessed in the global flue gas desulfurization market for thermal power plants 2018-2022. The power industry is governed by increasingly stringent environmental regulations. As a result, FGD systems are expected to operate at their peak efficiency and reliability. Power plant operators must install FGD systems that are compliant with the existing regulations while also ensuring that it does not impact their margins. 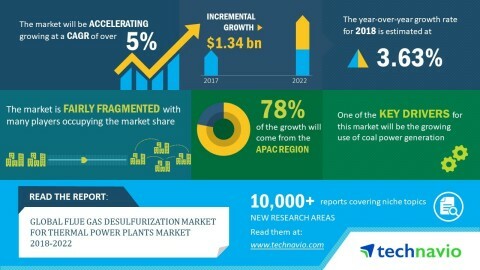 Technavio analysts forecast the global flue gas desulfurization market for thermal power plants to grow at a CAGR of over 5% by 2022.